Long thought to be little more than a hearty and savory morning treat, bacon is breaking out of its shell, thanks to author, Joanna Pruess. 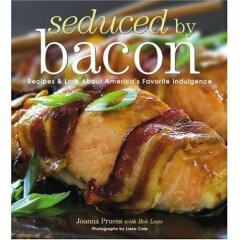 In her cookbook, Seduced by Bacon, she’s created enormously creative recipes that put bacon back in the spotlight. Bacon ice cream, anyone? Joanna Pruess has written for the food column of the New York Times Magazine, Food & Wine, Food Arts, Saveur, and The Washington Post, and was a regular contributor to the AP syndicate. She develops recipes for specialty food manufacturers in the U.S. and France. She lives in the Bronx, NY, with her husband, Bob Lape.